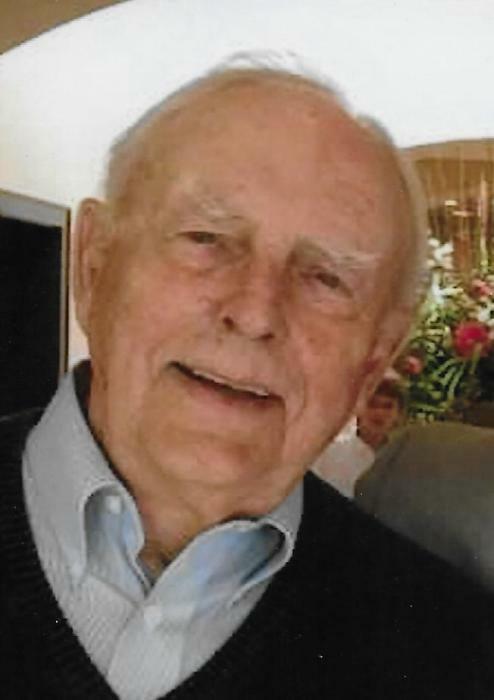 Russell Lyle Lock, 88, of Grand Rapids, Michigan passed away in the evening of Wednesday, April 3rd. Russ was born to Pleun and Jennie Lock on November 28, 1930 in their farmhouse on Ada Drive. Russ is survived by his children David (Elizabeth) Lock and Suzanne (Kevin) Han and grandchildren, Colton (Lauren) Lock, Mitchell Lock, Lucas Han, and Olivia Han, siblings Carol (Curt) Ullery and Carl (Sally) Lock. He is preceded in death by his wife of 53 years, Patricia, and siblings, Delores Stowell and Robert Lock. Russ served in the US Air Force from 1951 to 1955. Russ started Lock Landscaping in November of 1959 in Ada and later a nursery on his farm in Cannonsburg. He had a deep love for and understanding of nature that persisted throughout his life. An avid golfer, Russ enjoyed over 50 years of membership at Egypt Valley Country Club and traveled throughout the country visiting many golf courses. Russ had a wide circle of friends and family and truly loved his children and grandchildren. Private family services will be held Thursday, April 11th. Friends are welcome to join the family at a reception, which will be held Thursday, April 11th from 5:30 – 8:00 PM at Egypt Valley Country Club.